Once upon a time, defining account-based marketing (ABM) was easy. ITSMA pioneered ABM in the early 2000s as a strategic approach to create sustainable growth and profitability with a handful of a company’s most important clients. The goal of ABM was bringing the mindset, skills, and resources of marketing to individual account teams, and collaborating closely with sales, delivery, and key executives toward achieving the client’s business goals. Today, based on the great success of early adopters, as well as changes in the broader marketing and technology environment, ABM is suddenly being hyped as the next great revolution in B2B marketing. Vendors and pundits are making great claims about ABM transforming all of marketing. B2B marketing, especially for high-value, high-consideration services and solutions, typically involves connecting with multiple stakeholders, influencers, and decision makers within client accounts. It’s rarely so simple as selling to a single individual. As such, effective marketing and selling almost always requires understanding and responding to multiple viewpoints, concerns, approaches, and incentives within each account. Viewing individual accounts as entities similar to complex, multi-dimensional markets is therefore an essential approach for marketers aiming to connect effectively with clients and prospects. Client centricity and insight. With ABM, sales and marketing focus on solving the buyer’s problem, rather than promoting the solution they want to sell. This outside-in approach means understanding clients and their organizations in enough depth to create propositions that help them achieve their business objectives. Partnership between sales and marketing. ABM will only achieve its potential when sales and marketing work hand in hand. This requires more than agreeing upon definitions, rules of engagement, and a list of prioritized accounts. It means that sales and marketing are equal partners collaborating on the same team. Focus on reputation and relationships, not just revenue. ABM objectives focus on client lifetime value, going beyond lead generation and near-term revenue goals to drive increased mindshare and stronger, long-term relationships. Tailored programs and campaigns. Using a combination of market insight, account insight, and individual buyer insight, marketing and sales craft personalized content to drive interest and engagement. In recent years, the growing interest and demand for ABM has led companies to develop and implement three distinct types: Strategic ABM, ABM Lite, and Programmatic ABM. This original ABM approach is usually reserved for strategic accounts and executed on a one-to-one basis. With Strategic ABM, account teams build stronger relationships with a company’s most valued customers and prospects via highly targeted marketing interactions that demonstrate in-depth understanding of their business issues. Most importantly, Strategic ABM is done with clients, not to them, to drive value for both companies. With this approach, a dedicated, senior-level marketer works directly with one or a few strategic or key account teams on the sales side, and crafts fully customized marketing plans and programs for each individual account as an integral part of the overall account plan. This is a one-to-few model, typically applied to groups of strategic and/or second tier named accounts. With ABM Lite, marketing programs and campaigns are typically focused on small groups of accounts rather than individual accounts, usually 5-10 at a time, that share similar business attributes, challenges, and initiatives (e.g., tier-one retailers shifting to a personalized, omnichannel operating model). Collaboration with sales is focused mainly on key decision points, such as which accounts to target, which business issues to highlight, which propositions to promote, and how to tailor existing content for these one-to-few programs and campaigns. This is the newest approach to ABM. With Programmatic ABM, marketing shifts its traditional focus from generating, nurturing, and tracking leads by individual to an account-based view. This one-to-many approach is possible due to the latest technologies that enable razor-fine targeting, analytics, and personalization across hundreds or even thousands of identified accounts. With just one marketer working across hundreds of accounts, Programmatic ABM is much less marketing resource intensive and can provide coverage far beyond Strategic ABM or ABM Lite. Programmatic ABM can and should be aligned with the company’s sales coverage model. 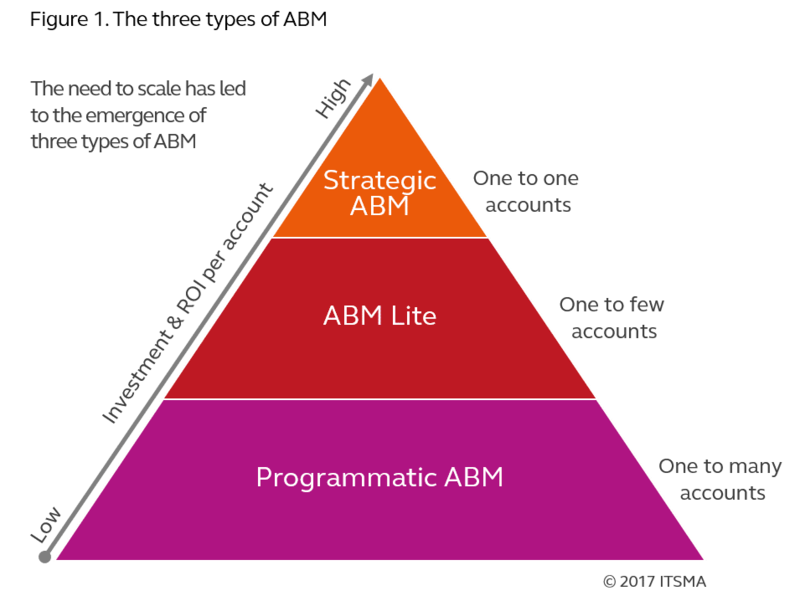 Companies use Programmatic ABM to target specific segments (e.g., horizontal or vertical markets) or other groups of named accounts selected from across an overall market. Marketers pushing to design, launch, and expand their programs need to understand the differences and implications of each type if they are to create an optimal strategy. And they need to make sure that sales and others are on the same page with the ABM approach or approaches they are taking. Download our Three Types of Account-Based Marketing Tool for more detail and recent research data on the three types of ABM. It’s a great tool to use with internal stakeholders. Interested in a deeper dive? Check out our new book, A Practitioner’s Guide to Account-Based Marketing: Accelerating Growth in Strategic Accounts.